Things to do in Algarve: waterparks, resorts, shopping and more. Zoomarine is an oceanographic theme park located in Guia, which is just a few kilometers outside of Albufeira. It is definitely fun for all the family, and is highly considered as one of the top theme parks in the region. There are 3 swimming pools; one for adults, one for children and one for babies and toddlers. These are surrounded by sunbeds, where adults can make the most of the sun whilst the children play in the pool. There’ll never be a dull moment for animal-lovers out there if you choose to spend your day at Zoomarine; there are a whopping 5 shows taking place at different intervals throughout the day. There’s a dolphin show, a seal show, a birds of prey presentation, a tropical birds presentation, plus an acrobatic pirate show! Visitors can also observe the natural habitats of different species; pinnipeds, reptiles, exotic & tropical birds and birds of prey. For thrill-seekers, choose one of Zoomarine’s 7 rides to enjoy or swim with the dolphins (at a little extra cost – but totally worth it). Overall, Zoomarine has something for everyone, and guarantees you a fun-filled, adventure-packed day out. Slide & Splash is a popular waterpark located in Western Algarve, close to Lagoa. It’s easy to reach from any point in the Algarve, and like Zoomarine, there are trips running here daily, with pick-up and bus travel included. The waterpark boasts many attractions; for small children, there are the soft slopes and a special children’s pool with all kinds of fun activities. The minimum height for most of the slides is anything from 0.90 to 1.20 metres, depending on the ride. For those visitors who want to relax, there are sunbeds dotted throughout the aquapark plus many grassy areas where you can lay your towel and sunbathe, at no additional cost. Try the Jacuzzi pool and let its powerful hydro-massage jets refresh you. On the other hand, for the adventurous types who love a good thrill, try the Black Hole and enjoy your ride in complete pitch black darkness. Race with friends on the Banzai, which is two high-up conjoined slides that you use a mat to race on. And it doesn’t stop here – you’ll find that there’s tons of rides to choose from. If the crazy rides just aren’t for you, don’t worry! Slide & Splash has daily parrot, reptile and falconry shows, plus relaxing Jacuzzis as mentioned before. There’s also cafes and seating areas where visitors can enjoy a spot of lunch. Choose from fast food options, light salads and snacks. Algarve Shopping Mall is one of the two best retail centres in the Algarve; the second one is located in Faro. Algarve Shopping is in Guia, which is about a 10-minute drive from Albufeira’s main city centre. If you’re staying in this area, a taxi should only cost anything from 5-10 Euros. This is a great opportunity for those tourists who wish to do a spot of shopping whilst on their holiday, or those who simply fancy a day out with a bit of window-shopping. A bonus of Algarve Shopping is its flexible opening and closing times; doors open to the public at 10am and they don’t close until almost midnight! With top-quality shops such as Zara, Mango, Springfield, Pull & Bear and Bershka, the women in the family definitely won’t get bored! As for the reluctant males, check out Portugal’s HMV equivalent, Fnac. This is located on the top floor (which is open-air, by the way. Shop and tan!) and allows shoppers to try out its new gadgets, such as tablets, laptops, 3D televisions, games consoles and the best new games. If you come at the right time, you may be lucky enough to catch a special guest appearance at Fnac; the small, American-style diner café at the back of the shop also has a stage, where performances by well-known European artists take place every couple of months. Also, the shopping centre itself has plenty of useful facilities. There’s a crèche on the ground floor for 2+ year olds, and it costs 5 Euros per hour, but if shoppers would rather take the kids along, there are pushchairs and pedal cars available, for free! There’s also a Pizza Hut, Burger King, McDonalds, KFC and more, located on the spacious top-floor food court. 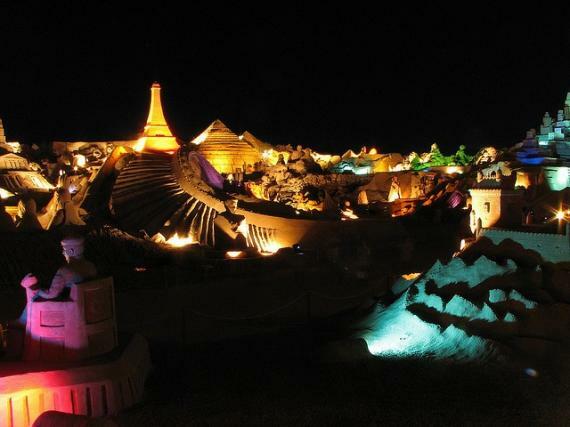 Fiesa is a mega exhibition of sand sculptures and is held in Armacao de Pera, which is a short drive from the centre of Albufeira. The exhibition began in 2003 and is considered the largest of its kind, worldwide! The sand sculptures add up to a colossal 40,000 tons worth of sand, and preparation for each individual exhibition usually takes up to 8 weeks. The theme for this years’ sculptures is music; expect to come across a huge, detailed sculpture of Elvis Presley’s face! Fiesa can make a great day out for families on a budget; tickets for children under 5 are free, and for children aged from 6 to 12, a ticket costs just 4.50. Adults pay just 9 Euro, and for adults over 65, there’s a thoughtful 15% discount. All of the ticket shops in the Algarve sell tickets for Fiesa, sometimes even on a special offer. During high season, the exhibition is open from 10am until midnight.